So we start our look at the world of Civilization VI: Rise and Fall with looking at the Cree, a First Nations Tribe located in modern Canada. One of the great additions to Rise and Fall was Firaxis picking civilizations that were directly impacted by colonisation, however, this did make the mapping project a little bit more difficult. So to determine the outline of the map, I have used the extent of the boarders at the time of the leader’s death/abdication/un-election. Now yes, as has been pointed out this is a very arbitrary point to pick, but whatever point you pick is going to be arbitrary and at least this keeps everything consistent. However, the Cree don’t nicely fall into that category because the Cree people once were found across the plains of what is now Canada but by the time of Poundmaker, the Canadian/British had taken all the lands of the Cree people. So in our Main Map, I decided to use the territory of Treaty 6 as the boundary as that was the core of the area being represented in the game. The Treaty zones were deals with the Indigenous people of the area and the government where they allowed expansion and resource exploitation, but as with a lot of treaties the government rarely kept up their end of the bargain and the treaties led to disastrous policies like the Residential Schools. With the city map, I found that while most of the cities were in the Treaty 6 zone, Firaxis focused on representing the wider Cree peoples in the list, so I decided to add the other Treaties to the map to give you the idea of the size of the land that was taken during the expansion. Ah, Georgia, the historical civilization that became a meme, then became a civilization in Civilization VI. There is a bigger story to that that you can read Here, but today let’s look at the map of Queen Tamar’s realm. One of the difficulties with this map is that where do you draw the line between core territories and tribute areas. When putting the map together I aired on the side of caution and went wide instated of tall when putting the map together. 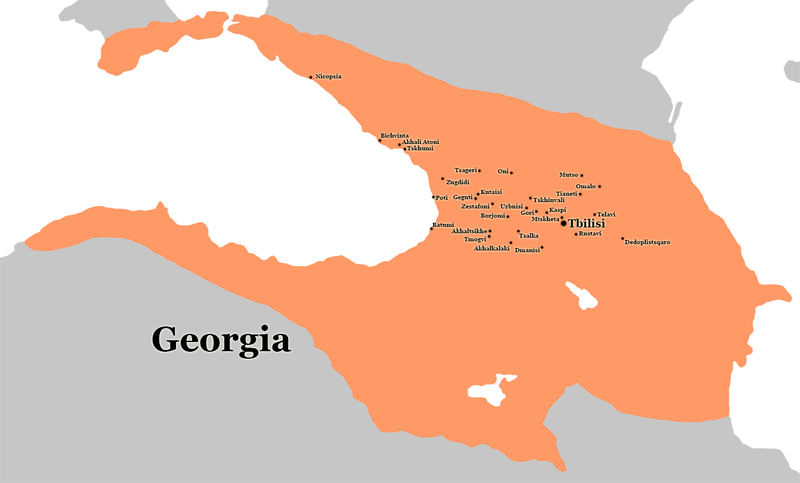 One of the interesting things about the cities is that they all fit inside the modern borders of Georgia, well as long as you include the breakaway regions that are only recognised by Russia. The one exception is Nicopsia a fortress town probably found in modern Russia. Ok, this one is a little bit of a cheat here because it is basically just a re-skin of the India city map from the base game See Here. 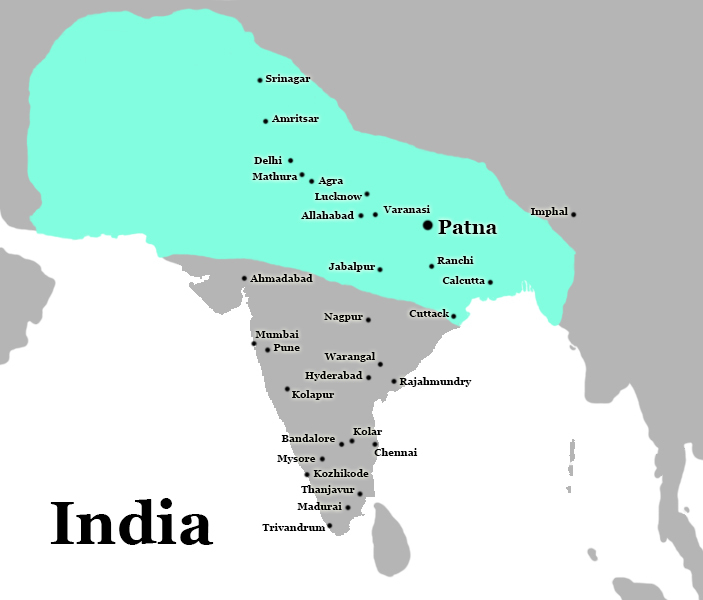 However, you can see with this map the difference between Gandhi and Chandragupta’s territory which shows how India has changed over the centuries. Also, it does call into the question why we get one India civilization when we can get Greece and Macedonia to differentiate, but that is something that will never change. Now … I think I went a bit overboard with the Korea map and ended up making much more work for myself that I probably didn’t need to do. In Civilization VI the Korea civilization is based around the Three Kingdoms period of Korea’s history. This is where Silla, Baekje, and Goguryeo fought for control over the Korean peninsula. So I thought it would be cool on the city map to show that Three Kingdom battle in a way that would not work on the big worldwide map. However, I didn’t take into account the very island-y southern coast that took a long time to create, that and think I made the map a bit too big. Well, that is now all in the past because the map is here now and I really kind of dig it. 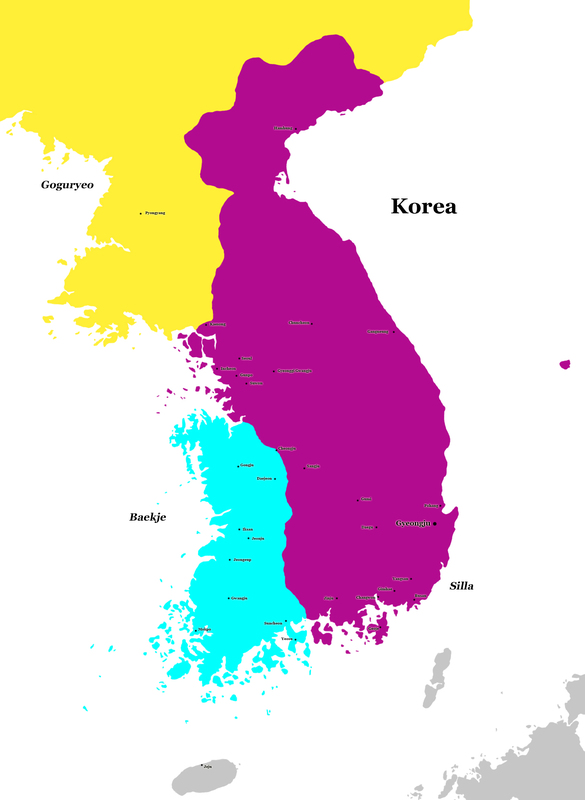 One of the interesting things I found when putting it together is that there was only one city in Goguryeo in the city list (though Goguryeo expanded much more in the years to come). As well as this, only three of the city list actually fall into what is today is North Korea. Now, most people won’t care about that, but I think I know at least one person who would probably mind. So look, I know in the grand scheme of things I am totally unimportant, and I have no bearing what so ever on Firaxis game’s civilization choices. That being said, I can’t help but feel that this is a city list that was single handily picked to cause me grief. 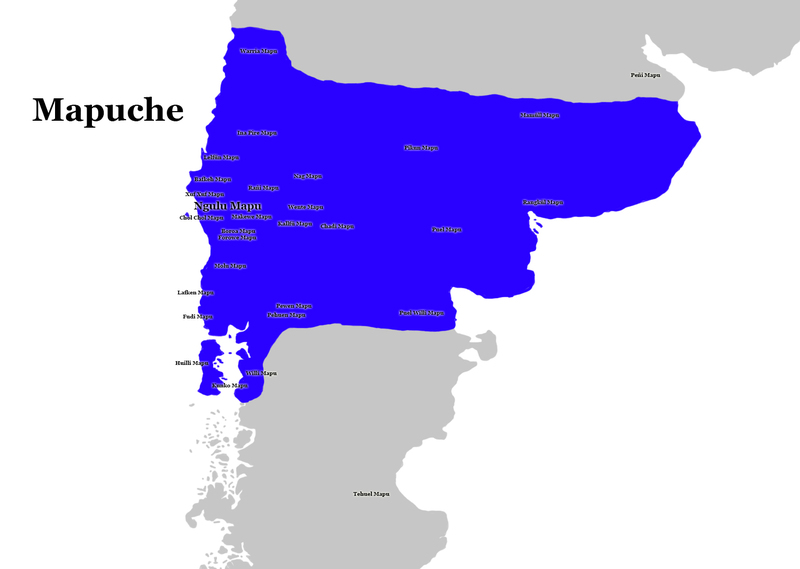 The Mapuche city list is not cities but instead are areas in the Mapuche language with ‘Mapu’ translating as ‘land’. So in some maps, I have had to troll through academic journals to find locations of ruins. Well, here I had to have multiple translated pages open, a crash course in Mapuche theology, and a deep regret that I never learnt Spanish. Even with all this, I am not completely confident that this is an accurate map, however, it is the best that I could do given the circumstance. However, one thing I did find was a fascinating history of a part of the world I was not familiar with before. The Mapuche fought off the Inca, sent the Spanish packing and only the combined campaigns of Chile and Argentine were able to force them off their land. It also showed a story that has repeated itself across the world with the subjugation of Indigenous people, the removal from their land, and the struggle to reclaim a lost identity. I do have to thank the good folks over in the Civfanatic’s Map thread for their help with this map. Mongolia is one of the fan favourites, it has been around since the first game, and was one of the big noticeable omissions from the base game, and I for one am glad that they are here, bar when you see their scout in the 2nd turn of the game. One of the interesting things putting this map together was how more contained it was compared to previous city lists. In Civilization VI the Mongolia city list was mostly contained to present day Mongolia and Northern China, in previous games, it has stretched into Central and South Asia. This was actually one of the more difficult maps to put together because finding some of the city locations turned into a bit of a nightmare, and I thought my Google-fu was good. In the end, I worked out that some of the K were Qs and that made things a lot easier. So this turned out to be the map that took the longest to put together because, like the Spain map in the Base Map, the city list included cities in the colonial empire. This meant that I had to make up the maps for each of the inserts, and each insert look about the same time as the bog map to create, making this about three times longer than the other maps to make. 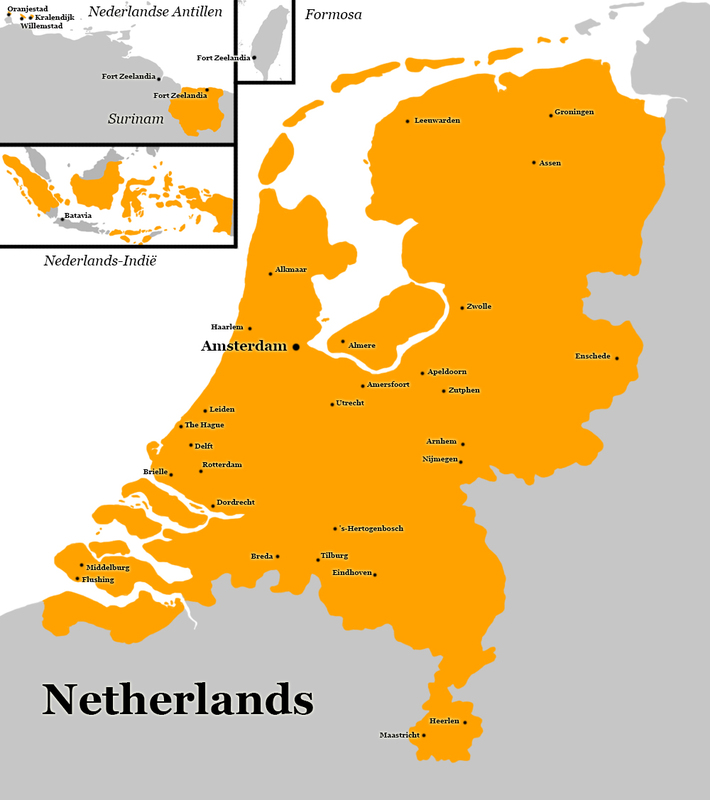 The Netherlands is also one of the reasons that if I do ever do one big giant map with every city on it, it will have to be a very large map just to fit all of The Netherlands cities on the map in such a small area. There was a city I did stumble on was Fort Zeelandia because from my research there are at least three possible candidates for its location. Now yes, it is probably the fort that evolved into Paramaribo, the now capital city of Suriname. However, the Forts in Formosa and Guyana are also strong contenders. One thing I was not sure with was if the modern maps of the Netherlands reflect the land with regards to the land making the Dutch have done over the years. But I was not able to confirm for sure, so I went with the modern maps. 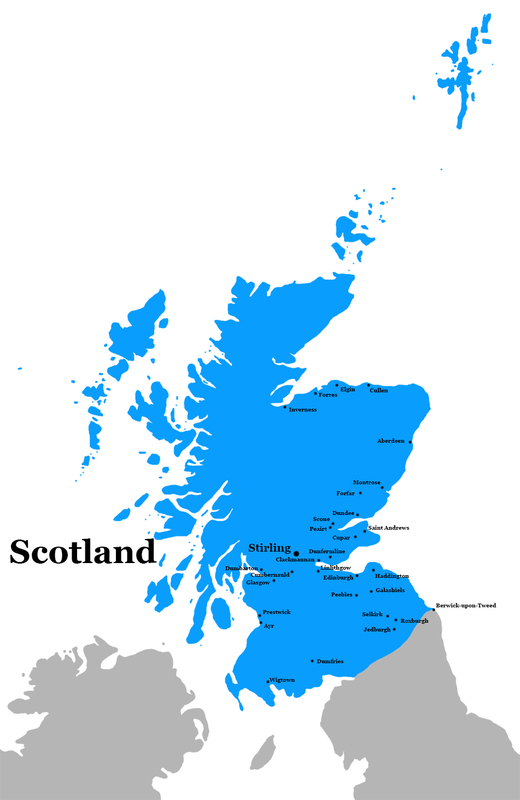 Of all the new civilizations in Rise and Fall, Scotland was the biggest surprise for me. This is because they have sort of already appeared in the game before featuring heavily in the Celtic city list for Civilization V. However, this is not the Celts that have appeared in every game since Civilization II but a completely different civilization. This is one where I was surprised with the layout once I had put all the cities on the map, we didn’t see much in the north or in the highlands. Given how the city pickers like to generally get a spread of cities from across the country the absence of the Shetlands, Orkneys, or the Hebrides is noticeable. But hey I’ll take the low road and you’ll take the high road and I’ll be in Scotland before ye. The final map today is the other fan favourite in the game The Zulu, and this was another complicated map to put together. 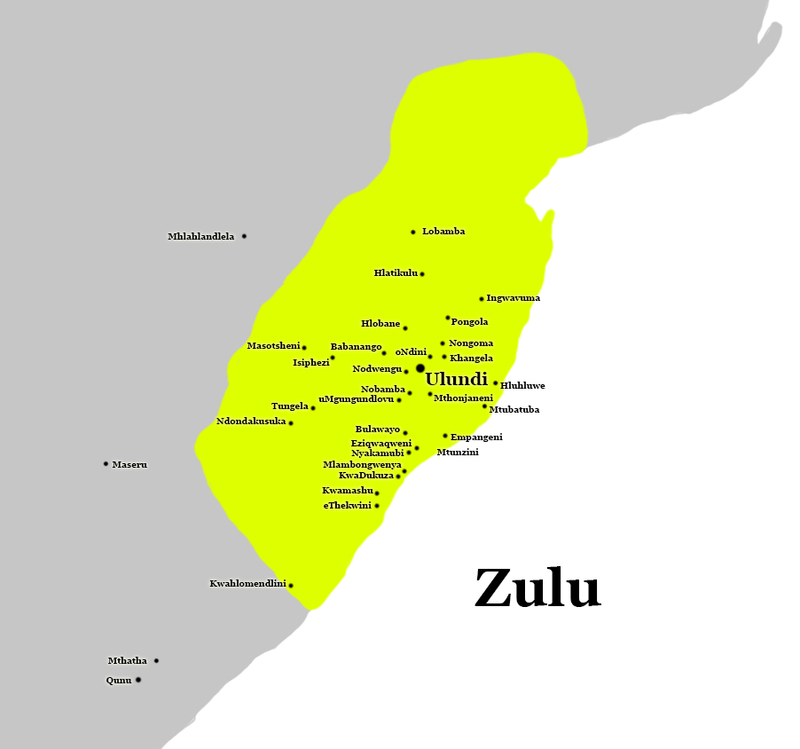 The first issue was that there was not a clear map of the Zulu territory to work off, just estimates which I have done my best to represent here. Also, a lot of place locations were clustered together and a lot of them I only found because the Zululand tourism board has a really good database to work from. So I am not completely sure that everything is exactly in the right spot, but everything should be in roughly the right area so you can get an idea of the locations. So there we have it all the current civilizations city lists mapped out, I hope you enjoyed it or at least found it interesting, and we will update if more DLC and Expansion packs get added. This entry was posted in Map-It, Video Game Reviews and tagged 2K Games, 4X, cartography, Civ 6, Civfanatics, Civilization 5, Civilization 6, Civilization VI, Civilization VI: Rise and Fall, Cree, Firaxis Games, Georgia, India, Korea, Map, Map-It, Mapuche, Mongolia, Netherlands, Rise and Fall, Scotland, Sid Meier's Civilization VI, Sid Meier’s Civilization, Turn Based Game, video games, Zulu by tldrmoviereviews. Bookmark the permalink.